Relax in Mandalaház! 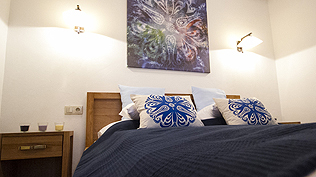 You are invited to our guesthouse to enjoy the best value in this area. 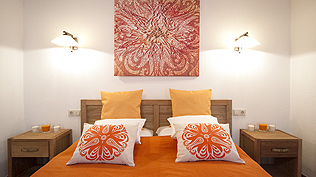 Let us cheer you up with the warm, sunny, happy mandalas of Sun Charm Room. Our wheelchair friendly Springtime room is inspired by the blossoming nature. Make yourself at home in our stylish kitchen, where you find everything for a cosy dinner. Taste our breakfast and dinner from delicious local ingredients. We collected the best, yet unpretentiously luxurious tastes from the countryside - for you! Let's JAMMING! Fill up your jars with fine selection of fruits, join us for canning in Mandalaház! We put a smile back on your face with this spectacular view near the village. 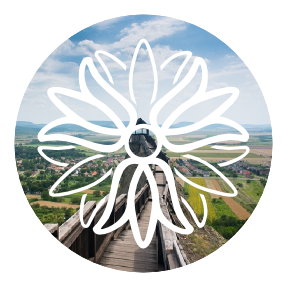 Travel back in time to experience the adventurous life in the historical Castle of Boldogkő. Love roaming with your children and taste the countryside? We can help you to find the best places! Would you relax at countryside in a drop of style ? Or try something special? We are here for you! WELCOME TO THE MANDALA HOUSE! Travelling is only worthwhile when you are going to a place that is better than home - or at least as good! When we planned the Mandala House, we were thinking along these lines. The walls that are a perfect fit for the atmosphere of Boldogkőváralja were built on this foundation. The mortar that was used were made from the harmony of the rooms, the generous comfort provided by the kitchen, and the various fine, perfectly natural materials used all around the house. All of these were joined by all the details that are for the comfort and entertainment of our guests - especially to the children! It's easy like that: the house is done, now the guests can come! Sunshine, narcissus, sunflower. The thick droplet of honey. The whistle of the thrush, inspiration, laughter, the love of life. The color yellow is like the sunshine: it emits exhilaration and heat. If you have ever entered into a room with walls of yellow, you know that its color will make you happy in an instant - if you choose this room, you can expect the same! The sprouts that come with spring, the shroud of a peach-tree, the smell of grass. Rejuvenation, virility. Green is the color of mother nature and harmony. Wherever you look at Boldogkőváralja, you can see the infinite shades of green everywhere - the color of the room that will energize you too! Cloudless, summer sky, the clear water of a river, the deep color of a cornflower, the beauty of a butterfly's wings. Purity, peace. Blue is the color of security and solidity, and that's exactly what the land all around us means to us, filled with harmony. Enjoy the Dewdrop room's tranquility!